Много добра - задълбочена, ясна и разбираемо написана въпреки сложната тема. Предметът със сигурност няма да е интересен (и понятен) за повечето хора, но за останалите е задължителна . Това е третата книга на Билингс, която чета и нито една не ме е оставила разочарован. 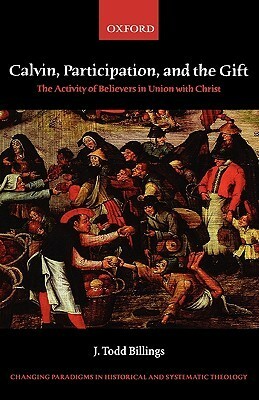 A good analysis of CalvinA good analysis of much of Calvin's thoughts regarding participation. This is not a 100 level book though. My rating is less a reflection of Calvin's thought and more of the quality of Billing's work. Billings (who I interviewed on his book The Word of God for the People of God) does an admiral job of interacting with a wide variety of Calvin's works to argue against voices (such as Milbank, Ward, Oliver, & Pickstock) who seem to view Calvin as inherently un-catholic and deficient with respect to his theologies of gift and participation. It isn't clear to me that Billings succeeds in highlighting a sort of humanism within Calvin's thought (though that isn't really what he's trying to do) and to convince those he argues against he'd probably need to deal with the metaphysical aspects of sovereignty and election. However he does show (quite clearly) that the criticisms that have been lodged against Calvin in these areas haven't sufficiently interacted with Calvin on his own terms and that human participation can be shown to serve important functions in Calvin's theology. Billings has produced an interesting and creative work at the interaction of historical and systematic theology that can actually serve as a introduction to Calvin on a number of matters. In his award winning first book, J. Todd Billings explores the relationship between God's gift of salvation and the activity of believers. In conversation with the 'Gift theologians' who have consistently maligned Calvin as someone unable to account for any meaningful action on the part of the believer, Billings shows that Calvin's doctrine of participation avoids false dichotomies and expresses God's empowerment of believers for a life of gratitude and service. This book moves at a high level, but is relatively accessible for the genre. Whether you are interested in the philosophical discussion of 'Gift' or simply trying to understand how to hold justification and sanctification together in a meaningful way, I highly recommend this book. This is a really nice book that offers an account of Calvin's theology of participation. Against those who read Calvin's view of God as a tyrant and humans as robots, Billings explores Calvin's richly textured themes of adoption, participation, and engrafting and shows that Calvin's is not a God who despotically controls life but as gracious Father that restores it. J. Todd Billings - J. Todd Billings (ThD, Harvard University Divinity School) is Gordon H. Girod Research Professor of Reformed Theology at Western Theological Seminary in Holland, Michigan, and an ordained minister in the Reformed Church in America. He is the author of several books, including the Christianity Today Book Award Winner Union with Christ and Calvin, Participation, and the Gift, winner of a 2009 John Templeton Award for Theological Promise.